OVERVIEW: We now move into October with the end of the quarter and quarterly options expiration behind us, and thus, I think we may get a clearer picture of where the indices are headed without any artificial underpinnings. While we had some intra-day volatility, there was not a dramatic change in index prices for the week. The Nasdaq 100 led the pack in performance, while the Russell 2000 brought up the rear. With the Nasdaq Composite closing back above its prior breakout level and the S&P 500 continuing its steady trend higher with little signs of distribution, we have removed the cautionary note we have been carrying within Market Gauge. However, we should still note that the small cap area and the Nasdaq Composite itself still carry enough distribution days over the last 20 sessions or so to warrant our attention. Now, let’s take our weekly look at the four indices we track here as we head into the fourth quarter. SPY- The S&P 500 ETF that we like to use here to track the index continues to carve out a beautiful up trending channel that dates back to late spring. Distribution days are still contained to a manageable three over the last 25 sessions and the index seems fairly immune to all the trade and tariff news if you take a step back and simply look at the chart. I will keep the commentary brief here because I think the picture accurately tells the story for this index. NASDAQ- The Nasdaq Composite violated its August breakout in early September and had been playing ping pong with that support/resistance area since. It was able to withstand another test of this area this past Monday and rebounded to finish above that level for the week. 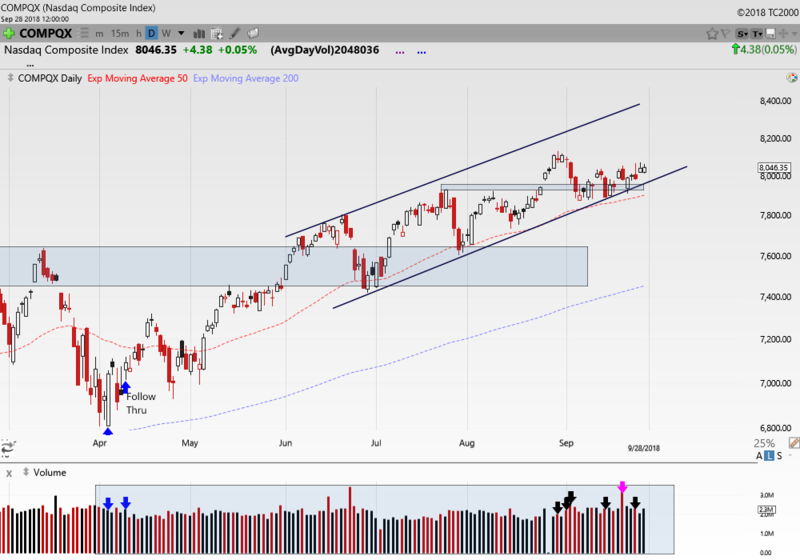 We closed the week above the 50 day EMA, trend and the aforementioned breakout support, but we do have six distribution days on the books if we count the option expiration session on 9/21. What bulls would like to see is a definitive move away from these support levels climbing back higher into the up trending channel. QQQ- The 100 had a good week moving up by 1.13% and it too reclaimed the prior August breakout level. 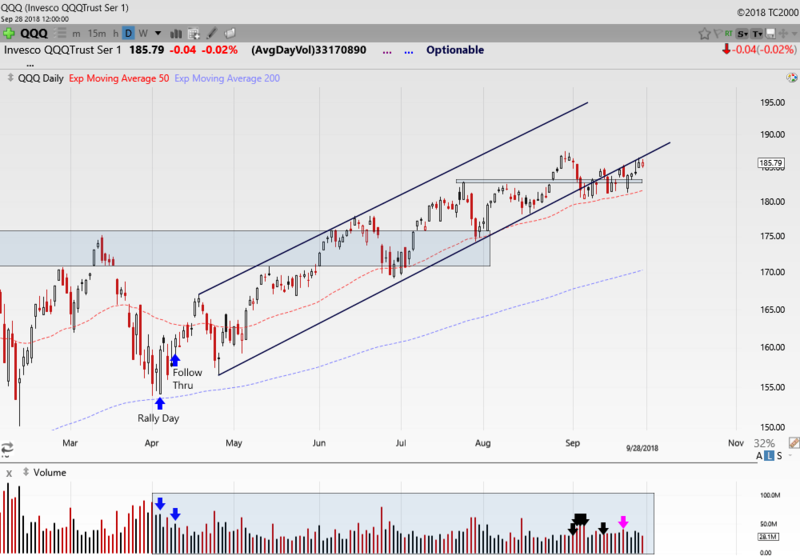 Like the Composite it also sits above the 50 day EMA, but has not been able to climb back into the six month channel. After a flurry of distribution days to start the month of September which led to the failure of the August breakout, distribution days have become scarce. It would be nice to see the index climb back above the longer term trendline however, we do put more emphasis on horizontal and moving average support and the index looks good in this regard. 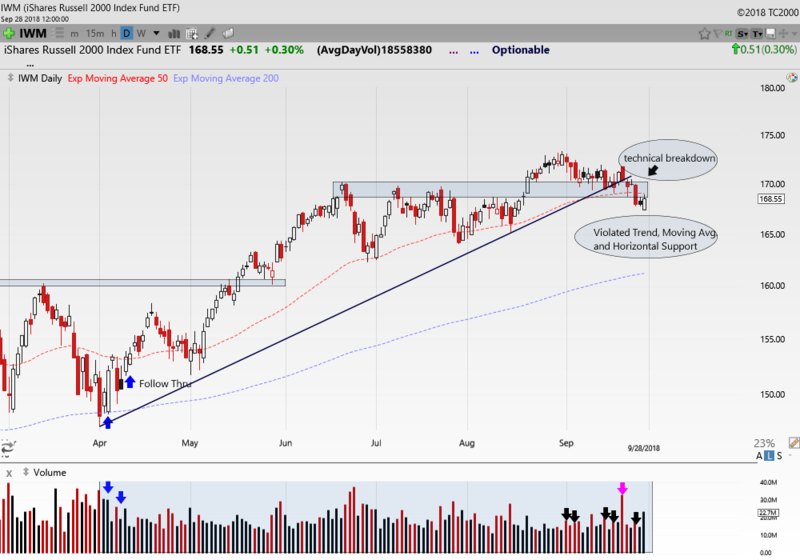 IWM- The small caps have been the main area of concern recently for the markets. 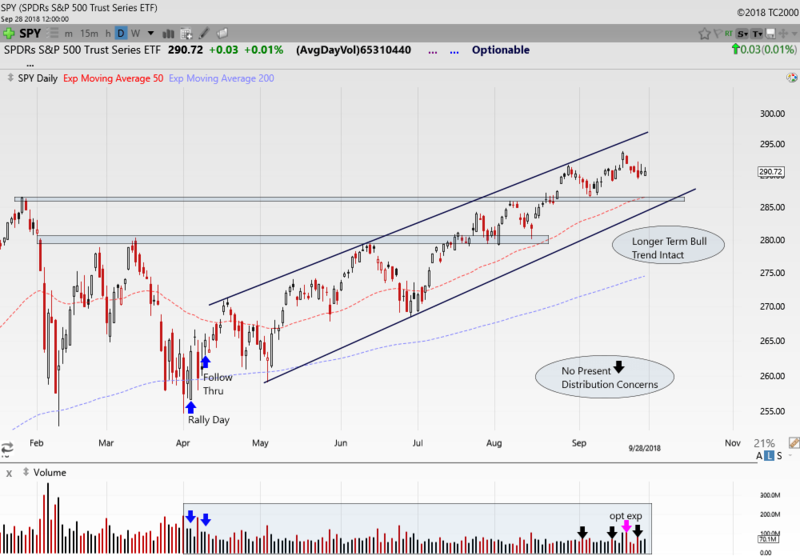 An August breakout failed to gain much traction and after three weeks of testing that breakout support near $170 the index gave way this week violating all three areas of support. We alerted members this week to not get aggressive on the short side of this index just yet. We feel that end of the quarter option hedging may have had something to do with the recent weakness and the risk of a near term fading of this breakdown is a possibility. Fridays action was a positive for the index as it out performed its peers. We would like to see how this index begins the new quarter this week before drawing too many conclusions. Like the Nasdaq, we do have six distribution days on the books when accounting for the options expiration day, although we must take this day in context. Join myself and Greg Krupinski of GK Trading at http://www.ttptrading.com for all the benefits of premium membership including real-time stock and option trading alerts and much more. See you there!